August 30, 2018. 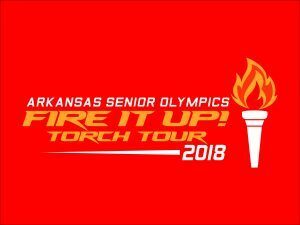 The third stop on the 2018 Arkansas Senior Olympics “Fire It Up!” Torch Tour took place in Hot Springs on August 30th, just across from the main steps of the Arlington Hotel in downtown Hot Springs. The event MC was Pete Blakeslee, the President of the Board for the Arkansas Senior Olympics. The US National Anthem was sung by Sheila Malone, a Parks Ranger in Hot Springs National Parks. Other guests present were local Board Members of the Ark. Sr. Olympics, and several Senior Olympics athletes that live in the area. THANK YOU TO EVERYONE that cam out to support this exciting Torch Tour Event! A special THANK YOU! goes out to Vernon Gingrich and to the Hot Springs National Parks. JULY 6, 2018. The first stop on the 2018 “Fire It Up!” Torch Tour took place in Fayetteville at Fayetteville High School. Fayetteville’s Mayor Jordan spoke and was in attendance. Ms. Senior Arkansas 2017; Sherry Marshall sang the National Anthem. Ms. Senior Arkansas 2108; Dixie Ford was present, as well as representatives of some local Chambers of Commerce and Visitors Bureaus and the Area Agency on Aging. Several local Senior Olympic athletes came out and were able to follow the Torch on a bike ride, and/or carried the Torch around the track. Kona Ice was also onsite for the entire event, and we send a special shout out and thank you to Shane at Kona Ice for keeping us cool and your generosity. If you are in Fayetteville area go visit a Kona Ice and pass along a message to Shane telling him “Thank you for supporting the Ark Sr. Olympics!”. A local Fayetteville fire truck and crew also helped “Fire It Up!” in Fayetteville. THANK YOU FAYETTEVILLE and EVERYONE that attended! July 31, 2018. The second stop on the 2018 Arkansas Senior Olympics “Fire It Up!” Torch Tour took place in Jonesboro at Jonesboro High School. Jonesboro’s Mayor Harold Perrin spoke as the first speaker of the day, followed by the Public School Athletic Director David Daniel, and AAA of East Arkansas’ Director of Purchased Services, Melissa Prater. Also, in attendance was Ms. Senior Arkansas 2018, Dixie Ford, and Ms. Senior Arkansas 2010, Judy Hargrave Fisher, and Ms. Senior Arkansas 2012, Donna Kingston, who sang the National Anthem. Several local Senior Olympic athletes came out to show support, and some played a game of Bean Bag Baseball. Brenda Moore carried the Torch on her bike around the track to kick off the event. A special THANK YOU! to Danny Kapales of the Jonesboro Parks & Recreation for all of your efforts to arrange this event. And a THANK YOU to David Daniel for allowing the event to be held at the JHS track. A local Jonesboro fire truck and crew also helped “Fire It Up!” in Jonesboro. THANK YOU JONESBORO and EVERYONE that attended! 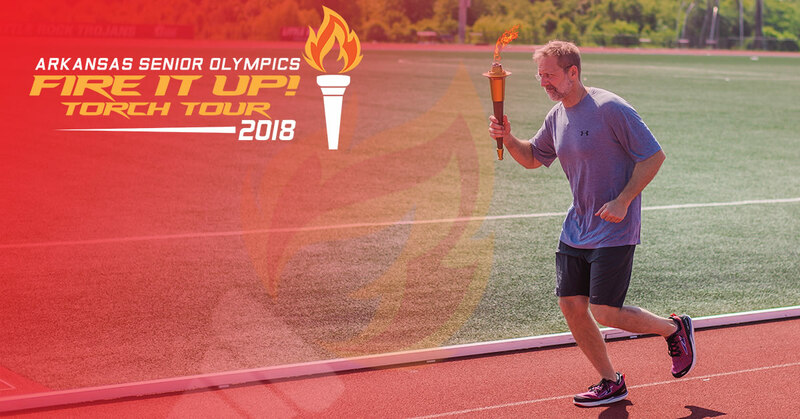 NOTE: If you are interested in a “Fire It Up!” Torch Tour Event in your city or town in Arkansas, just let Greg know by calling 501-321-1441.